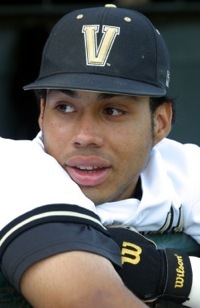 "Gut instinct I needed to come to college"
Pedro Alvarez, third baseman for the Commodores baseball team, was selected as the No. 2 draft pick in the country Thursday, June 5, in the Major League Baseball Draft. The Pittsburgh Pirates picked him after the first draft pick went to the Tampa Blue Rays. Three years ago, Alvarez was offered almost a million dollars to play for the Boston Red Sox. But Alvarez, 18 at the time, turned down the money and honored his commitment to Vanderbilt--and to his own education--instead. In 2006, he was named National Freshman of the Year. In 2007, he earned consensus All-America honors. In 2008, despite missing 23 games with a hand injury, he still hit nine home runs and finished in a tie for the career school lead with 49. At El Nuevo Caridad restaurant in Washington Heights, $12.95 can get you a special of ox tail, rice, pinto beans and lemonade, otherwise known as "the Pedro Alvarez." And though the dish is not quite as renowned as a "Manny Ramirez" (goat stew) or a "Pedro Martinez" (chicken stew with avocado) -- at least not yet -- it's special nonetheless to the baseball-loving owner who serves it. "Pedro [Alvarez] is the heart of this community," says Miguel Montas, owner of Caridad. "If I've dedicated plates to people that I've met after they were in the big leagues, then why wouldn't I dedicate a plate to somebody I see as a son?" "When I was choosing [whether] to go play baseball or come to college, I just had this gut instinct I needed to come to college," Alvarez says. That judgment is a credit to Pedro Sr. and Luz, whose quiet demeanor was passed on to her son. The family, like many Hispanic families, is extremely close. In the nearby Hall of Fame club, where a group of 125 season-ticket holders were invited to watch the event on TV, broke out into what one observer called "great applause." Alvarez's parents, Pedro Sr. and Luz, came to the United States from the Dominican Republic two decades ago. Alvarez was 1 year old when the family settled in the Washington Heights section of upper Manhattan. The elder Alvarez handed his son a baseball bat at the age of 3, and Pedro has not let go. Like many others in their mostly Dominican neighborhood — an area that straddles Washington Heights and Inwood — the Alvarezes hoped their son’s skills on the baseball field, if carefully tended, might one day finance a college education. His parents went to college in the Dominican Republic, but when financial responsibilities intervened, they took jobs and neither graduated. In 1981, Pedro Sr. arrived in New York. His wife and 1-year-old Pedro followed in 1988. Their daughter, Yolayna, was born a year later. “He always wished that his first child would be a boy,” Yolayna Alvarez said recently, interpreting for her father, “and that he would be able to go to school because of baseball. And that’s exactly what happened.” She just finished her freshman year at St. John’s University, and she hopes to eventually attend law school. “He was the only guy who could hit the ball over every single tree,” said Elbert Garcia, his friend since elementary school.